Desert Sky Tours was registered on 26th July 1995 and commenced operations following the purchase of an International Mk5 6WD bus. Jenny and Howard operated the coach travel for a period of 15 years,during which time many people joined us to experience the Australian Outback and the successful Business won a number of Awards. Howard is a fully accredited tour operator, a graduate of Environmental and Cultural Tourism, and has many years 4WD experience, and is keen to ensure the visitor is fully informed of all aspects of the trip, both on tour and prior to departure. 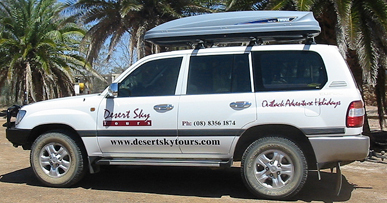 At the end of June 2010 the coach vehicle was retired, and a Toyota Landcruiser (100 series) purchased to enable Howard to continue with 4WD "personalised" tours. Jenny remains a partner in the business, assisting with bookings and trip preparations. The most popular trip is a 9 day Birdsville/Innamincka itinerary, during which the visitor experiences a vast contrast of landscape, including sand dunes, gibber plains, saltbush and wildflowers. This trip is particularly preferred by the more mature age group, as it is based on Motel/Hotel accommodation, and provides a warm bed and great meal after an interesting day in the outback! A good winter escape to the Outback, combining the opal district of Coober Pedy and the spectacular Breakaway country is a 9 day trip to William Creek and the Painted Desert. We experience a night at William Creek, underground motel accommodation in Coober Pedy and return via Woomera, Olympic Dam and Roxby Downs. This trip has wide variety of scenery and many attractions of diverse interest. Another popular trip is to the Flinders Ranges, travelling through Wilpena Pound, Blinman to Arkaroola, with return through the equally spectacular Gammon Ranges and the Moralana Scenic route to Hawker. The price, as with all trips includes hotel accommodation, all meals, plus the world famous Ridgetop Tour. A favourite is the Flinders Ranges, using Rawnsley Park as a base, and experiencing a breath-taking "Sky Trek" day trip on Willow Springs Station. This is the highest vehicle access point in the Flinders Ranges, and the views are stunning. Tours depart from and return to Adelaide, and prices include accommodation and all meals. All images on this site are copyright 2003.